I’m pleased to confirm that the Dartmoor Magazine will be joining our local exhibitor panel at Coombe Trenchards English Country Garden Festival this year on the 1st and 2nd of June. Editor Sue Viccars has kindly included a feature about our Garden Festival in the Spring issue of Dartmoor Magazine, which is out now. Always one for returning the favour, supporting independent enterprise in this beautiful part of Devon - todays blog post shares afew questions I put to Sue about her role as Editor, and what readers of the Dartmoor Magazine can expect from this lovely local publication. Q. Tell us a little about yourself and how you came to be editor of Dartmoor Magazine. A. I studied geography and archaeology at Exeter University, then took up a job with a publishing company in London for a brief spell before managing to move back to Devon (always the plan!). After 20 years as a commissioning editor with David & Charles Publishers I went freelance in 2000, and now work as an editor (books as well as Dartmoor Magazine), author and photographer, specializing in writing walking books all over the South West, with particular reference to Dartmoor and Exmoor. I have been editor of Dartmoor Magazine since 2008, and joint owner of the business with my brother since 2013. Q. What do you most enjoy about your role as editor? A. It’s really great to ‘have to’ get properly immersed in every aspect of somewhere as special as Dartmoor! I commission the magazine, and decide what should be published in each issue. I have regular meetings with my contributors, who are a great bunch of people and who all have a real interest in this remarkable part of the country. I’m lucky to be able to work from home too, and have a genuine excuse to get out on the moor as often as I do. It’s also great that my other work – writing walking books – often doubles up with whatever I might be doing for the magazine: for example, photos I take when out and about can be used for a number of different purposes. Q. 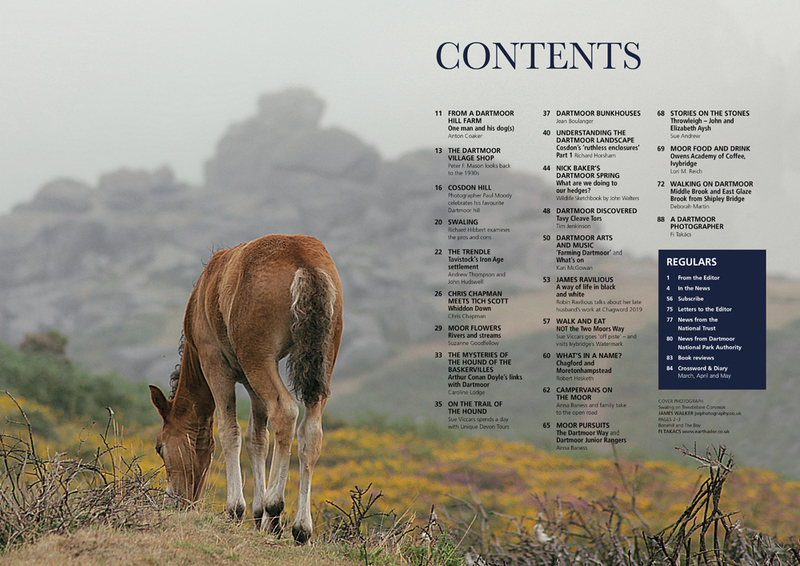 How long has Dartmoor Magazine been established, and what would you say is unique and special to the publication? A. The magazine was started in 1985, so it’s coming up to its 34th birthday! It's an unusual publication in that it’s not advertorially led, by which I mean that the articles aren’t dictated by the fact that we may or not be able to sell advertising space to support them. It’s not a lifestyle magazine – there are not features on fashion, or cars, or interior design, for example. All the articles are about Dartmoor ‘proper’ – the photography is fantastic – and the editorial pages take pride of place (as opposed to having to wade through pages of advertising before you can get to something to read). It has a healthy and very devoted following, many of whom have bought every issue published since 1985. Q. How many issues to you produce a year? A. Four - spring, summer, autumn and winter. Q. Where can our readers get hold of a copy of the magazine? A. Anyone interested can buy a copy of the magazine at one of our 80+ sales outlets across and around the moor, as well as at some of the major supermarkets in the vicinity. Subscriptions and single copies can also be purchased via the website www.dartmoormagazine.co.uk or by calling us on (01647) 441174. Q. In this ever-changing digital age how do you feel about print? A. I still think there’s a place for print – curling up on the sofa with an iPad isn't quite the same as doing the same with a good quality magazine or book and having a good read! Q. Tell us about the spring edition of the magazine – what can readers look forward to? A. This spring’s issue is, as always, packed to the gunnels. 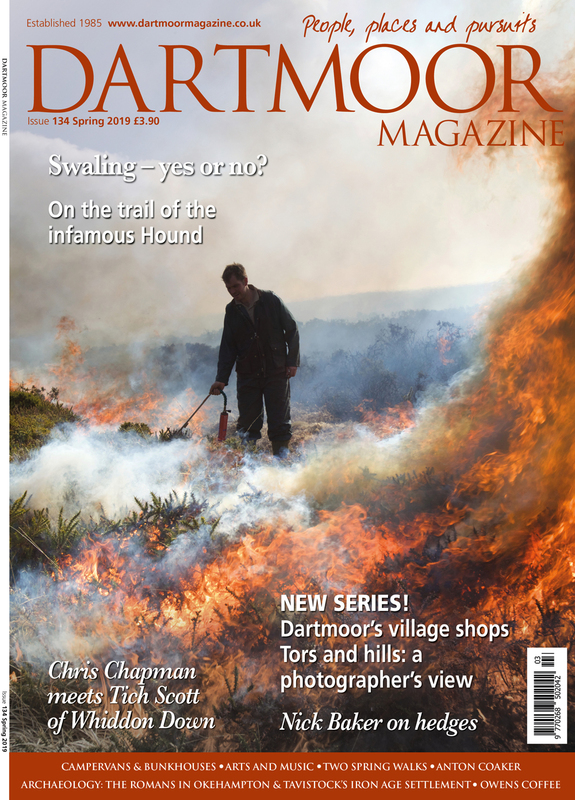 We’ve got a fantastically dramatic front cover image of swaling – burning off the gorse on the moor, which is done in early spring – and an excellent article which discusses the pros and cons of the practice (it’s quite controversial). The well-known Dartmoor photographer Chris Chapman interviews local character Tich Scott; wildlife presenter Nick Baker looks at the way Dartmoor’s hedges are treated at this time of year; and we’ve got two new series, one on Dartmoor’s village shops, and the other a beautiful photographic study of a particular hill or tor. Then there’s a look at the local arts scene, at moorland flowers, local bunkhouses, two great walks, the latest news, and diary… there’s masses to interest everyone. Q. If you had to choose a favourite time of year when it comes to the collation of the magazine and its content – what would you choose and why? A. I don’t really have a favourite time. When you work as closely with the moor and with the changing seasons as I have to (when editing a quarterly magazine) you realise that every season has its own particular beauty. I suppose I could say that I prefer the ‘out of season’ times, when the moor is less busy – but there are always places to go, even in the height of the summer, where you will have the moor to yourself. Q. We are thrilled to be welcoming Dartmoor Magazine to our English Country Garden Festival on 1st and 2nd of June this year. What are you most looking forward to about the festival and fair season, and what will visitors to the festival be able to discover at your stall? A. It’s just the most beautiful place to spend a couple of days – especially in an English summer! I enjoy meeting subscribers (and potential subscribers) throughout the summer show season, and it’s a good way of getting feedback about how people feel about the magazine. On the stand we will also have a range of southwest walking books – ones I have written or edited – including my most recent, an extended and revised edition of The Two Moors Way: Devon’s Coast to Coast walk. We’ll also have Dartmoor cards and a good selection of books written by local Dartmoor authors. Our thanks to Sue for supporting us and for answering these questions. With just under 3 months to go until our English Country Garden Festival takes place for the 8th year, I shall be sharing more interviews and blog posts highlighting some of the terrific supporters and exhibitors that you can expect to find at this years event over the coming weeks. Here’s to those warmer days, and to a great English Country Garden summer.